Stop the car! Desired floor plan - great room, den/game room, amazing kitchen with raised cherry wood cabinets. Granite counter tops w/full back splash. Stainless steel appliances, gas stove. 5 bedrooms, one downstairs, 3 full baths. Fresh paint, new wood floors, reverse osmosis, water softener, 1000psi remote controlled misting system and plantation shutters through out. 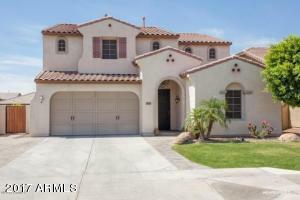 Professionally landscaped front and backyard, extended side drive way w/pavers. Epoxy flooring in garage w/storage cabinets. Play pool w/ water feature,extended patio w/ramada.